Home > Photo Editing Tips > How to Remove Text and Words from Photos? We love taking photos using our digital cameras as well as smartphones. Photos allow us to capture a moment and relive it later. Thanks to amazing cameras found in smartphones these days, photography is now within everyone’s reach. Many times we encounter some unwanted texts or words in our images that affect the overall quality of the image. In such situations, we feel the need for a way to erase the text from images without affecting the quality of the images. We can also feel such a need when we want to use an image that has a watermark over it. If you find yourself in such a situation, then this guide will be very helpful to you. In this post, we will share how you can delete text and words from photos. 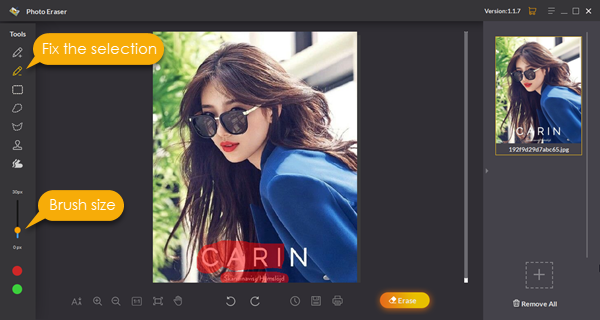 In order to easily remove text and words from photos, we can use a desktop application called Jihosoft Photo Eraser. It is available for both Windows and Mac desktop operating systems. You can download it from the download button below. Of course, this is not the only application available for this purpose. Adobe Photoshop is the oldest and most powerful tool for such requirements. However, these are highly professional tools and require a huge learning curve. Jihosoft Photo Eraser, on the other hand, is almost as powerful and yet highly simple to use. This is a multipurpose tool that provides many features to its users like text removal, unwanted object removal from photos and old photo restoration. Anyone can start using it quickly. Its very powerful and simple to use. Once the application is installed, open it by double clicking its icon. You will be greeted with the main UI which has been divided into 3 main sections. All the tools are arranged in the leftmost pane. The central pane has the image which needs to be edited. The right most panel shows the thumbnails of all the images that have been imported inside the application for editing, and you can hide it when you want to have more space to show your editing photo. You can refer to the above image for reference to all the tools that are available for use. To remove the text from an image, you need to first import the image into the application. 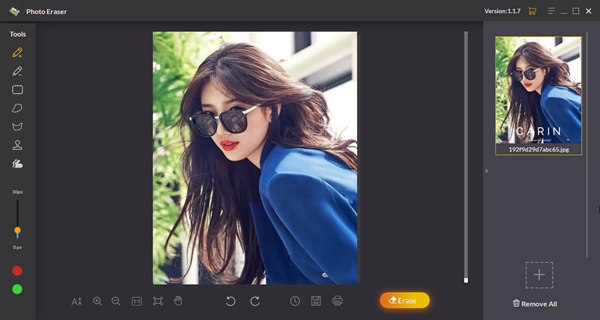 To do that just click on the Select Photo button present in the main panel. You will also see another button named Select folder. 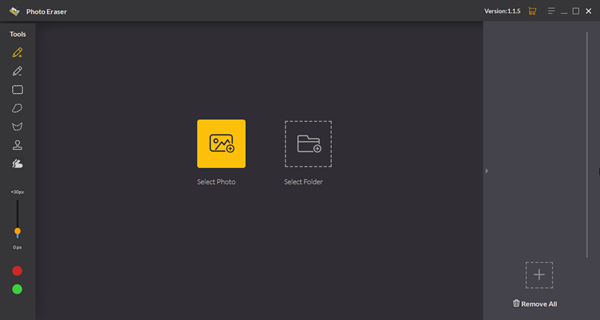 You can use this to import multiple images present inside a folder. Once the image has been imported into the application, you need to follow the below steps to edit words out of a picture. Step 1: Select the brush tool from the left most toolbar. You can refer to the image above to find out which tool is the brush tool. Step 2: Now simply brush over the text area in your image, that you want to delete or remove. The area you brush over will be highlighted by red color. Step 3: If you make any mistake, you can modify the selection area by using the Fix the Selection tool. If you want to fine-tune your selection, you can change the brush size, using the tool provided in the left toolbar. Step 4: Once you have made the selection, just click on the Erase button. This can be found at the bottom toolbar of the application. It is not present initially but appears when the selection has been made. You will see that the software will magically remove all the texts that you selected from the image. The image will appear as it never had any text in it to begin with. Removing text from images used to be quite a tedious task which required the use of professional tools. And not everyone could use them. Only trained professional could use them and deliver good looking results. But technology has come a long way now. There are plenty of softwares that allow their users to achieve complex results using easy to use softwares. And Jihosoft Photo Eraser is one of them. It costs only $19 for a lifetime usage license and for the amount of features it offers, it definitely worth the money. And did I say that you also get free software updates and support. If you are still not sure of buying, you can always download the trial and check if the software fulfills your requirement or not. But I am sure you will not be disappointed. How to Remove Wrinkles, Pimples, Acne and Skin Blemishes from Photos?